A full day trip that begins with a complete 3 hour tour of the city in an Air-conditioned Minibus in small group. 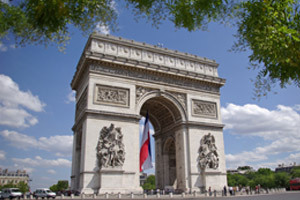 The easiest way to discover Paris, that will give you an entire overview with all the major sights : Eiffel tower, Trocadéro (photo stop), Champs-Elysées, Concorde Square, the Opera, Vendome Square, Notre-Dame cathedral (photo stop), the Louvre, Madeleine church, Invalides, the Arc de Triomphe, the Seine River banks. After the city tour you will savour a lunch on a covered-glass cruise boat along the Seine River. Then you will continue the journey towards the vantage point of Montmartre to overlook the city, wander around the painters’ square and visit the Sacred Heart basilica.